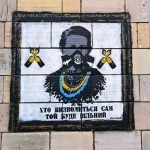 On February 10, 2014, when the violent clashes began in Hrushevskyi Street, a painter under a pseudonym “Sociopath” made graffiti on the wall of the Institute of Ukrainian Language of the National Academy of Sciences (Hrushevskyi Street, 4), which depicted outstanding Ukrainian cultural figures of the 18th and 19th centuries: Taras Shevchenko, Lesya Ukrainka and Ivan Franko wearing balaclavas. 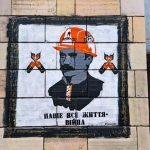 On September 2, 2017, journalist Tetyana Vysotska wrote on Facebook about the disappearance of these graffiti from the facade of the Institute of Ukrainian Language, the first floor of which is leased to the luxury furniture store “Emporium.” She attached photos and videos to her post, showing Ihor Dotsenko, the store owner, who instructs the worker to wipe off the graffiti. Earlier, Dotsenko commented on this event on his page on Facebook as follows: “It’s just typical street art that is regularly being cleaned up by community services. So, calm down and don’t make a tempest in a teapot.” The destruction of the graffiti caused an outcry from the society (on September 3, a protest gathered near the store. 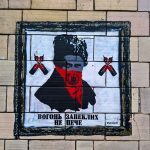 The activists broke its glass doors and wrote on the walls: “There was the Maidan, and it will be here forever,” “You will not erase,” and “Never do it again”). Then Dotsenko changed his point of view and insisted that he had nothing to do with the destruction of the graffiti. 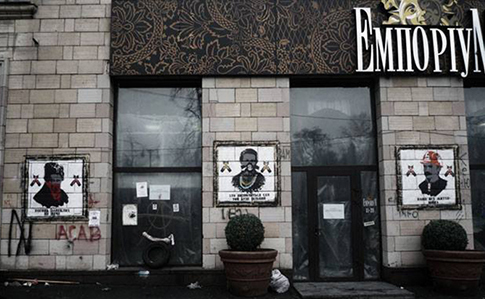 Moreover, he claimed to be a victim of the vandals: “Dear citizens, ‘Emporium’ is closed. Despite the fact that we were looking after the graffiti for three and a half years, we became hostages of the provocateurs who destroyed them,” said Dotsenko. Subsequently, it turned out that Dotsenko had no right to paint over the wall. “Emporium” has been renting the internal area of the building of the Institute of the National Academy of Sciences, and therefore has no right to interfere with the facade. According to the Institute employees, there was not a word about the building exterior in the lease agreement. “The authority responsible for cultural heritage protection has to conclude special agreements, which will specify what a tenant is entitled to do and what is he is not. However, according to the law, the absence of such provisions does not exempt the owner or tenant from the responsibility for damaging or destroying a cultural heritage monument,” informed Тimur Bobrovskyi, member of the International Council on Monuments and Sites. The author of the original graffiti has already volunteered to restore them, but on the condition that he will receive a legal right to do this. “None of the representatives of state institutions but ordinary Ukrainians have asked me to restore the portraits. I hope you understand that unauthorized restoration in this situation is impossible. I promise to you all that I will restore the Trilogy as soon as the situation develops properly,” “Sociopath” wrote on his Facebook page. What will happen to the graffiti and the premises leased to the store is as yet unknown. The National Museum of the Revolution of Dignity wants to make an exposition there. However, the Directorate of the Institute says that after the contract termination, they will not lease this premise. 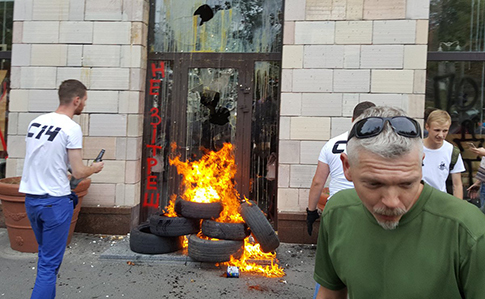 The Kyiv Prosecutor’s Office has already initiated a criminal investigation into the graffiti destruction case. The perpetrators will face either a fine of 2,550 hryvnias or up to 3 years of imprisonment.